If you haven't heard by now, Apple is giving away free stuff like videos, music, books and apps for free for 12 days, so you probably missed yesterday's offer which was a Maroon 5 EP. All you have to do is download the 12 days of Christmas app from the appstore to get access to the free stuff as you won't likely see it if you head straight to iTunes or the App Store. 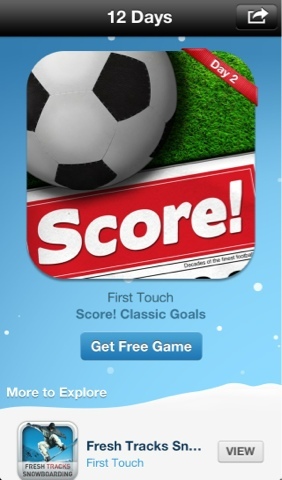 The tradition continues today and this time it's a free game called Score! Classic Goals. It looks like its a football game with some pretty decent 3D graphics. If you're not into that sort of game you could always download it, after all it's free, then remove it from you iDevice so it won't take up space but so that it will still show on your purchases and then in the future, if you have someone who's into that sort of game you can just redownload it, that's the beauty of the cloud. So get downloading and stay tuned for tomorrow's free stuff.